Much like every other season, our greens are still stuck in their dormancy stage. Although they woke up at the beginning of the month for a day or two, this Cato Bentgrass certainly does not take to cold weather at all. We are continuing to cut or roll them to ensure a smooth playing surface, but other than that there is not a lot we can do until our soil temperatures begin to rise. There are still some visible holes from the fall aerification, which again, shows the lack of growth we have received since the start of October. This is another reason for my desire to topdress. I am still keeping safe our brand new flags due to these never ending high winds we seem to be experiencing. Hopefully these die down soon! Despite the little amount of play we have had since the start of the season, there still seems to be an abundant amount of ball marks being left unrepaired. Please do your part as a golfer, especially during these soft conditions. Again, due to the cold temperatures, we have seen almost no growth this year. We will begin our normal mowing practices once we see some growth. We are also putting a premium on reducing thatch layers in our tees this season, and as such, you can expect to see the vertical mower on the decks much more this season. Please remember to use the provided divot caddies at every tee deck. These caddies contain a sand and seed mixture, which when used promptly and properly will aid in the turf recovery from the onslaught of divots. At the moment, many tees are saturated from the heavy rains this week. Don't be surprised to see this condition continue with our long term forecast showing a lot of rain fall. Although the fairways are growing at a quicker pace than our tees and greens, these as well have gotten off to a slow start this season. To say the fairways are wet would again be an understatement. We have been forced to cut through some very wet conditions this week for the simple fact of not letting the turf get out of hand, and as such they are not as "picture perfect" as we would like to see. You will have noticed the divot caddies in the fairways have been painted red at the 100 yard mark, white at the 150 yard mark, and blue at the 200 yard mark. Again, please make use of these to aid the turf crew in maintaining beautiful fairways. Once again we are looking for some drier weather, so we can get back out with our Aerway, and give some relief to our saturated soils. Surprisingly, our rough areas are beginning to grow. Sure some spots have not yet woken up yet (mainly those on mounds which are exposed to harsh winds), but there are some spots out there that are growing like crazy. We have started the mowing process in the most active areas (mainly the back nine), and will continue to do so over the next week. At this point, I am thinking that by this time next week we will be in full maintenance mode with respect to rough mowing. With the wet conditions, we have been forced to restrict cart use several times this season. We have very heavy clay soils, which when saturated, do take time to drain. We are very fortunate here at Sawmill to have a fairly successful drainage system in place in comparison to a couple of local courses, however, these systems still need time to work. Please be very cautious at all times with cart traffic, and abide by our local rules with regards to cart paths, as well as other cart traffic control measures in place. It is also that time of year when it can be difficult to tell where the rough ends and the fescue begins. If you see some misplaced souls driving through our fescue, please help them out of the fescue and onto safer paths. This is the one area that I am not concerned with at all! The resiliency of the turf crew is shown everyday, as they have been forging ahead despite the wind, the rain, snow, and even a flu bug which has been passed around the Turf Care Centre over the past couple of weeks. We are still not up to full staff yet, and won't be for a couple more weeks. Yet the folks here are still managing to keep the golf course in great shape. Well done everyone! Okay, I left the most contentious issue for last, and trust me, I could go on forever about our bunkers; but I won't.....it's Good Friday after all! You can see from the photo a couple of issues. 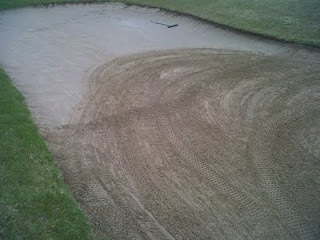 The first being that there are some spots in our bunkers which are simply way too wet to even put the bunker rake into. We could risk sinking into the sand, and perhaps destroy the drain tile which is present. As such, our operators are instructed to avoid very wet areas of the bunkers. The second issue is the fact that there are still tire marks left behind after having been raked. ow this is a two fold issue involving the trap rake itself. On this rake, there are tines located in the centre and the rear of the machine. These tines do wear down quite rapidly when we are raking daily. Now to start every season, we do keep a set of worn down tines on the machine until the sand in the traps has been moved around enough to ensure that all drainage tiles are sufficiently covered, and cannot be damaged by the trap rake tines. Once we are confident enough that we will not do any harm to our drainage systems, we do install new tines on an every 3-4 week period. Of course the comment is always brought up about why we therefore do not hand rake bunkers. With 87 traps on the course, and the limited staff we have, this scenario will never be feasible. If you ask most golf course superintendents what their biggest headache is, most will inevitably answer bunkers. I can tell you that bunkers are one of the most expensive line items we have here in the Turf Department. Of course this is very frustrating to any golf course manager/owner/superintendent for one simple reason; THEY ARE HAZARDS! Anyway, enough of my rant on bunkers; let's hope for some drier weather! Overall, the course has been slow to get going this spring, but things will turn around once we see some growing weather arrive. Let me tell you, I am just as anxious as you are.....I'm sick of wearing these winter coveralls!